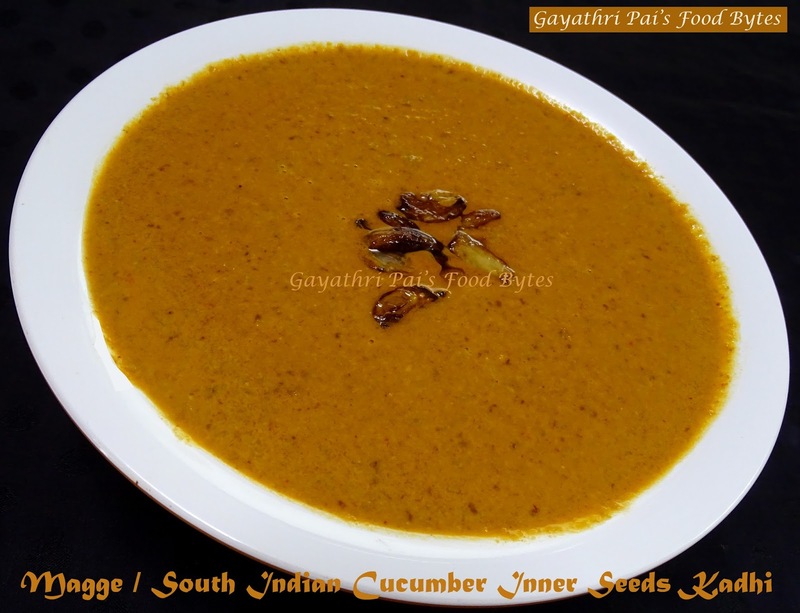 Gayathri Pai's Food Bytes: Maggebeeyechi Kadhi / South Indian Cucumber Inner Seeds Curry. Maggebeeyechi Kadhi / South Indian Cucumber Inner Seeds Curry. ** Magge / South Indian Cucumber is extensively used by GSB’s / Konkani Saraswat’s, so also by all south Indians. This vegetable is said to have immense coolant properties and is very good for health. There are many dishes that can be prepared out of the same. Many a times we discard the innermost seeds from this cucumber as inedible. But these seeds to have loads of healthy nutrients and one should not just discard the same. I however never knew we could prepare this thick gojju type curry out of the inner most seeds, though I was aware it was used in preparing chutney. It is even washed, dried and used in preparation of deserts etc. But to be true, I myself have never prepared anything out of these seeds to date. I just threw them off. When my friend Sri Kripa who has a lovely blog "Kripas food Diary" posted a recipe in our food group “Konkani Delicacies” using these seeds I was really overjoyed. She has so many such recipes that use seeds, seed flour etc. Do go through her blog, I am going to share the link to her recipe also at the bottom of this recipe, you may please check up on her version too and try out the same. I have added garlic as in my home we are very partial towards garlic flavour specially towards dishes like these. By and large I have followed her recipe except for a few changes in method to suit my way. But trust me if you try this recipe, you will never ever want to throw away the inner seeds of magge again. ** Like Shri Kripa says Magge / South Indian Cucumber / Southekai has a very fleshy interior centre part, which is almost jelly like watery fleshy part with edible seeds. These seeds are very rich in minerals and nutrition, so it should not be discarded. According to her it is traditionally called Sauthe kai beeja da saaru / rasam. Which means curry prepared using the inner seeds of south Indian cucumber. ** A word of caution before using the core ie the inner fleshy part with seeds is that you have check if they are bitter. Some cucumber impart bitterness and those are not good for using in cooking form. The inner core has to be flavorful with the awesome aroma of magge if you have used them in cooking before. You can check up on the smell by inhaling deeply and also pop in a few into mouth for checking them for bitterness. Garlic / Losun : 3-4 peeled. Tamarind : small marble sized ball. Jaggery / Gud : ½ tsp grated (optional) … I have not used. Garlic / Losun : 4-5 peeled and slightly crushed. ** Do not discard the inner seeds with little bit of flesh part attached to it while using South Indian Cucumber. You may collect it and store it in an air tight container in fridge for a day. It remains good for 24 hours. ** Put the collected seeds, I had about 2 heaped cups in a pressure cooker along with half a cup of water and pressure cook on mediym heat for 1-2 whistles. Let the pressure from the cooker drop on its own. Once you are able to open the lid, gently open and allow the cooked seeds to cool. Now put them in a mixer grinder along with another half a cup of water and grind to a smooth paste as much as possible. You may add in more water if necessary. ** Remove the ground pulp and sieve through a very fine sieve. Put back the roughage obtained while sieving back into the mixer grinder add some water and grind once more and sieve the same. Collect the sieved water and keep it ready aside. ** Heat coconut oil or any other edible oil, in a thick bottomed kadai, when hot lower the heat and add in the garlic and fry till they are slightly browned. Now add in the coriander and fry for a minute and then add in the methi and jeera. Add in the turmeric powder and If using whole red chillies add them now and further fry for a minute. Fry all for a minute or two and then add in the grated coconut and mix well. Fry for 3-4 minutes till you get a good aroma. Finally add in the chilly powder, if using powder, mix well and remove from fire. ** Note : I have added kashmiri red chilly powder. When you add powder to very little oil and fry the same it turns blackish in color and the colour of the curry does not turn the awesome red colour I love, so I prevent the addition of the powder into the oil and add it towards the end and remove from fire immediately. This helps in retaining the colour, however, you may do so if desired. ** Put the fried ingredients into the mixer grinder along with tamarind and grind to a very fine textured paste with a little bit of water. Do not add in more water. You can also use the sieved water retained from cooking the seeds for this purpose. Remove the fine paste into a thick bottomed stainless steel vessel and add in the cooked, sieved seeds water and mix well. ** Check the consistency, if needed add in a little bit of water. But retain thickness and do not make it into a very thin texture as here I have prepared it in kadhi from which is always kept thick. Add salt to taste and the jaggery if you want (I have not) and bring to a boil on medium flame. Mix in between often to avoid it getting burnt. Lower the heat and simmer for a good 3-4 minutes. ** For Tempering : Heat the coconut oil in a small pan, when hot lower the heat and add in the slightly crushed garlic and fry it they are evenly browned. Pour this over the simmering curry and remove from fire. Cover with a tight lid and keep it aside for some time for the flavors to seep into the kadhi. ** “Maggebeeyechi Kadhi / South Indian Cucumber Inner Seeds Curry” is done and ready to be served. I have prepared this in kadhi form which is always thick in texture. You can also make it thinner like rasam and relish as appetizer. I relished this yummy garlic flavored kadhi with Red Boiled Rice / Ukde SheetHa and found it as the best combo dish. You may serve it with normal / ordinary cooked rice too or even with mildly spiced pulav. I am sure it will taste great. Do try my version of this kadhi and enjoy with your family and friends. ** You can use the search option for "Magge or South Indian Cucumber" in my Blog, where you will get many more dishes prepared using this healthy vegetable. Do try out various types of dishes to relish with dosa / Idly / roti etc. or with dal-chawal too. Enjoy the dishes with your family and friends and do give me a feedback if possible. You can also click on the link below for checking the same. Kadgi Bajo (Bajia) / Raw Jackfruit Fries. Ripe Jack-fruit Egg Muffins / Ponsa Egg Cup Cake. Tomato Chicken Curry with Panpolo (Neer Dosa). Spricy Urad Dal ~ Dahi Toya. Nachani Halwa / Finger Millet (Ragi) Halwa. Dry Fruits Kayi~Holige / Coconut Puran Poli.